Here are some other bead and wire wrapping works that I have done. Here are some of my macrame bracelets that I have done within a year. In my little experiment I used black tea (Lipton yellow label & Pirkka Earl grey), Rooibos tea both natural and flavored (Lord Nelson, Loyd & Pirkka) and chamomile tea (Lord Nelson). The papers I used were watercolor /drawing paper (max. 140g/m2), watercolor papers (HanArt 180g/m2 & Kapel 210g/m2) and mixed media papers (Canson imagine 200g/m2 & Strathmore 300g/m2). I also used some thick brown packing paper, tissue and napkin papers and a glossy photo paper (HP advanced). I'm not sure which paper was the thin paper (140g/m2). Because I remember combining two sets of papers inside one cover. I had saved some tea bags (rooibos) from the evening snacks. When the bags were dry I opened them and took out the tea. I saved the paper from the tea bags, the dried tea, the packing paper and even the strings. For this particular piece of work I only used the dry tea. I mixed the dried rooibos tea with some 13arts' modeling paste and used it with a stencil by Latarnia morska. I could have used more modeling paste since the texture was a bit dry but it turned out to be okay. So that's the only tea part for this piece. I was actually just trying to see how it would work and it eventually turned out to be better than expected. I have been participating in a card challenge on Facebook. If you are interested in this challenge, you can read more about it in Marta Lapkowska's blog or go straight to Facebook and find a group called "Maremi's Creative Cafe". The group is closed, so you need a membership to see what's in there. You can also try the hashtag #52CafeCards on the Facebook search bar. I believe you can use it in Instagram as well. 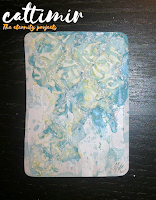 The challenge is about making an ATC-sized card every week. Well, you don't have to make it exactly every week, you can make them in your own pace, but a new theme is published about every Tuesday. The challenge is in an alphabetic order at the moment, the letter for this week is "O". No announced theme, yet. The cards can be mixed media, drawing, painting or any desired art form. My cards are mostly mixed media but I have tried some drawing, too.